Since its debut in 1989, the St. Lawrence String Quartet seems to have taken a fiendish pleasure in doing everything possible to break down the public’s persistent lack of interest in the world of string quartets. But you can forget the outdated image of the music lover half listening to a quartet while sipping a vintage cognac: the musicians of the St. Lawrence quartet, on CD and even more on stage, let loose a musical passion and artistry that is the envy of many established ensembles--and with good reason. In a few seconds you’ll be bowled over by the musical intensity of these seasoned performers. The flamboyant movements of first violin Geoff Nuttall--he of the weird and wonderful hair--have frequently been remarked upon by the press. But focusing on such external details seems simplistic and pointless. There is no question that Nuttall’s entire body moves with the music, that some of his solos are infused with a sense of urgency, and that at the high point of a given work he appears to be in a state of exaltation that is more usually found at rock concerts. However, the other quartet members have no problem allowing their own confident personalities to filter through their performance. Second violin Barry Shiffman, a pal of Nuttall’s even before the quartet was formed, has a phenomenal capacity for listening. During a concert he lets himself be steeped in the sound, and you can feel him vibrating in response to the most subtle changes of tone or attack. Cellist Marina Hoover presents a calm and collected image, but she penetrates the surrounding soundscape with delicate sureness, which is why she is perhaps the group’s anchor. Blonde violist Lesley Robertson’s solid technique enables her to fall in with the slightest surges of expression without missing a beat. These four seemingly divergent personalities in fact conceal four extremely hardworking musicians who deconstruct, analyze, rehearse, and assimilate the works in question until they totally understand them, from the most classical of quartets to recent compositions such as Miracles in Mud, specially written for the group by Jonathan Berger, their colleague at Stanford University. From that time on, the St. Lawrence Quartet worked tirelessly, although never giving concert performances at that point. They took on the challenges of the repertoire, soaking up the European approach to interpretation and adapting it to their more contemporary perception of the medium. At the conservatory the quartet also learned the rudiments of talking openly to one another, which now enables them to resolve their musical and technical differences--matters that inevitably arise in chamber music. Tolerance and a willingness to adapt have shaped their very different personalities into a superior entity, the soul of the quartet. “The ultimate aim of a quartet is to have four individuals working to reach a fifth dimension,” says Brott. The St. Lawrence Quartet soon left Toronto for the United States, there to continue their studies with the masters. 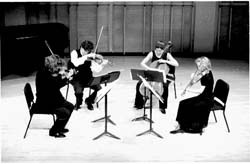 From 1990 to 1992 they were the first to take part in a new program at the Hartt School, Hartford University, working closely with the Emerson Quartet. 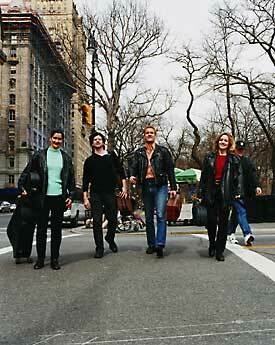 From 1992 to 1994 they were the graduate string quartet in residence at the Juilliard School, and between 1994 and 1996 they worked with the Tokyo String Quartet at Yale University. Since last year they have been teaching at Stanford University in California, where they direct chamber and string music programs, give lessons, master classes, and numerous recitals that regularly include works by composers-in-residence at Stanford. In September, nine years after their spectacular win of the 1992 Banff International String Quartet Competition, Marina Hoover became a judge at this prestigious event. Today the St. Lawrence Quartet is still the only Canadian quartet to have won the Banff quartet prize, and music lovers still remember their electrifying performance in the competition finals. 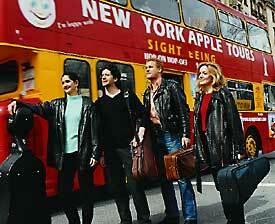 The quartet’s travels enabled them to work closely with some of the greatest chamber musicians. Even so, recognition by other musicians and the general public didn’t happen instantaneously. The quartet was invited to play in prestigious venues such as Carnegie Hall or the Opéra de Paris, but it continued to perform in school auditoriums and halls far from the major centres, partly to make ends meet but mainly to reach a wider public. The quality of their playing was as exceptional as ever, no matter what the audience or the grandness of the venue. Music lovers young and old were enchanted. “It’s not such a bad thing that the audiences are older; people sometimes develop a taste for chamber music later in life,” suggests Geoff Nuttall, himself an enthusiastic admirer of opera and... pop music. At the same time, the group has many fans among children who are discovering chamber music for the first time. Nuttall’s slightly off-the-wall aspect makes it easy for him to communicate with the coming generation. “If we succeed in opening the ears of only two or three children and they become interested via the instrument or the medium, our goal is pretty well achieved,” he says. The musicians never talk down to them and consider each question as if they were hearing it for the first time. The motif is explained, the key of the piece given, the theme demonstrated, sometimes with the help of a few dance steps--and then, within seconds, the quartet switches to the performance, recovering their extraordinary power of concentration and executing con brio an extract from a contemporary work or a more classical selection from Mozart or Tchaikovsky. The great Russian composer was chosen by the quartet as the focus of its last recording (see the review on page 50). Shiffman says, “In choosing Tchaikovsky we once again turned to a repertoire that we felt wasn’t as celebrated as it should be (like the Schumann Quartets).” The earlier Schumann recording was greeted with enthusiasm by critics, who admired its intensity. Their debut album on EMI featuring Schumann won the 2000 Juno Award for “Best Classical Album (solo or chamber),” as well as the German critics’ recording prize (Preis der Deutschen Schallplattenkritik). Shiffman feels some nostalgia about the orchestral works which he no longer has the chance to work on. Several of his friends are members of top orchestras. In an ideal world he’d like all orchestra musicians to be obliged to play in chamber ensembles, whether string quartets, wind quintets, or mixed groups. “After all, it’s the most beautiful music on earth!” he exclaims. Like the river after which the quartet is named (reportedly chosen during a riotous evening in Denis Brott’s living room), the group members have adapted to the challenges of the chamber musician’s life without the need for any change of personnel--a rather rare feat among string quartets. “We haven’t been able to get rid of this guy!” jokes Shiffman, pointing at Nuttall. But in all seriousness, the group’s strength seems to have emerged because its members are so independent. When they’re on tour, none of them worries about what the others do, as long as everyone shows up on time for a rehearsal or concert. (In Ottawa for the most recent chamber music festival, I saw Geoff Nuttall striding past me on the mall toward Tabaret Hall, carrying his music stand and dress clothes, while his three colleagues had decided to share a taxi).